A census town of Biate in northeastern Mizoram has made a mark in Swachh Survekshan 2018 awards announced by the Centre on Wednesday bagging the Best City award in ‘Innovation & Best Practices’ – NE Zone category. The results were declared by Union Urban Development Minister Hardeep Singh Puri in New Delhi. Hyderabad was chosen as the Best State Capital/UT in “Solid Waste Management”. In Zonal categories, Siddipet was selected as cleanest city in South zone, while few peripheral areas in the city namely Bodupppal (Best City in Citizens Feedback-South Zone) and Peerzadiguda (Best City in Innovation and Best Practices-South Zone). 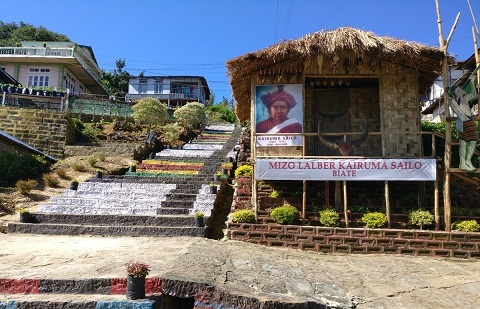 The township of Biate made headlines in Mizoram when it was announced the cleanest town in Mizoram earlier this year. Biate is a census town in Serchhip district in the state of Mizoram. Congratulating the town for having won the national award Zodintluanga, minister of Urban Development & Poverty Alleviation thanked the people of Biate town for their relentless efforts in putting the map of Biate on the national level. As a part of the Swachh Survekshan 2018, total marks for assessment was increased to 4,000 from 2,000 in last year’s survey. Categorywise assessment of open defecation free (ODF) progress, collection and transportation of solid waste and processing of solid waste saw their respective weightages being increased in this year Swachh Survekshan. “It is encouraging as well as challenging to learn that Biate has made it to the top cleanest 4303 towns in India. Biate is one of the 23 urban towns we have in Mizoram. Thanks to the people of Biate. The rest of Mizoram has a daunting challenge, we can make Biate in our own towns and villages,” Zodintluanga said. With roughly a population of over 2,000, Biate takes a sense of pride to be one of the first open defecation free towns and also placed itself as the cleanest town in Mizoram. Biate began its cleanliness drive for over a decade before Prime Minister Narendra Modi launched the Swachh Bharat Mission in 2014. Once a week, members of the association would make use of their time to clean the streets. However, the 20 years of insurgency in Mizoram posed an obstacle for the smooth sailing of the cleaning activity in the town. The children’s initiative was revived in 2003 and this innovation of the town’s younger generation has moved the mindset of the whole population in their approach to cleanliness.